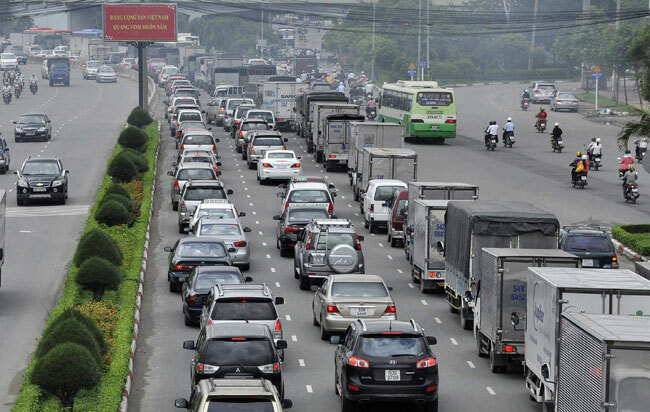 HCM CITY (VNS) — Despite constant efforts by city authorities, traffic congestion in HCM City has become worse due to inappropriate planning, drivers' lack of safety awareness and overloaded roads. Nguyen Hoai Nam, deputy director of the city's Department of Planning and Architecture, said lack of long-term planning was one of the most critical causes of traffic congestion. Resolving traffic jams in one area often ends up causing congestion at another site, as vehicles rush to other roads. Pho Quang and Hoang Minh Giam streets in Tan Binh District, for example, did not become congested until parts of Pham Van Dong Street opened to traffic two years ago, a move that was done to relieve congestion at the city's eastern gateway. Commuters now flock to Pho Quang and Hoang Minh Giam streets, which connect with Pham Van Dong Street via Nguyen Thai Son and Hoang Minh Giam roundabout, causing serious traffic congestion, especially during peak hours in the morning. Overloaded roads and new construction of high-rises on many streets in the inner city have both contributed to traffic congestion, according to the Transport Department. Although many new roads have been or will be completed or expanded, the increase in population in recent years continues to be a factor as well. Dr. Khuat Viet Hung of the National Traffic Safety Committee, however, said the problem was due mainly to the rapid pace of construction of housing and offices, rather than a lack of roads. In the inner city, more and more buildings have been built, but the subway, underground parking areas and pedestrian-only streets have yet to be completed. Hung said that land prices in the city outskirts were low, but most of the offices and amusement centres, schools and hospitals were located in the inner city. As a result, people travel to the city centre and return home every day, resulting in traffic jams, particularly at city gateways. Nguyen Ngoc Tuong, deputy chief of the HCM City Traffic Safety Committee, said although the number of traffic jams lasting more than 30 minutes had dropped, they still occurred frequently, especially during peak hours at road project sites. The city has a total of 39 congested spots, he said. Another contributing factor is the selling of goods or food as well as the parking of motorbikes on sidewalks in the city centre. Pham Van Ba, head of the HCM City Council's legal department, said encroachment on the roads and sidewalks by sellers was the main reason for traffic congestion and accidents. He said the local authority must be held responsible. Nguyen Ngoc Tuong, deputy chief of the HMC City Traffic Safety Committee, said this year the city would put more police on major streets affected by congestion. The city will also run campaigns against drinking while driving in an effort to reduce the number of traffic accidents. In addition, the Transport Department plans to crack down on transportation services, and will impose strict penalties on overloaded vehicles and illegal buses. The city will also speed up road projects, and review and set up more traffic electronic boards on the streets to improve traffic flow.